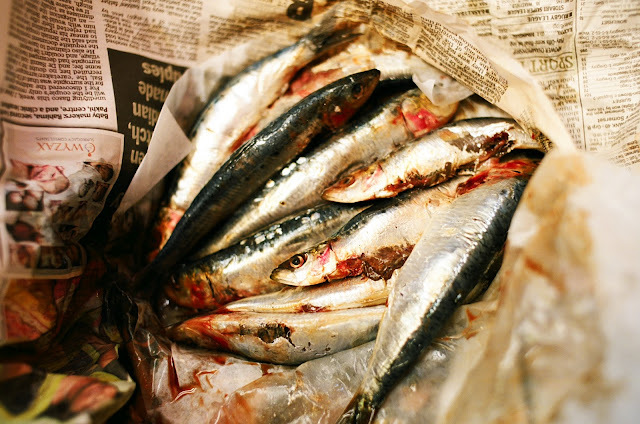 Fresh sardines are something of a delicacy in central London - rarely available and usually more the size of a mackerel. A visit to the Kent coast yielded these wonderful specimens and all for the princely sum of £2.40. Somehow good ideas seem to become hackneyed stereotypes alarmingly quickly but fresh and local do seem to yield the best produce and often the cheapest. Authenticity is also another complex issue as every individual seems to have their own take on what constitutes the truly authentic. Can an Italian recipe ever be authentic when it is made outside of Italy? Then there are degrees of Italianess - Sicilian, Palermitan - the classification gets smaller and the authenticity increases. Personally I find it all slightly tiresome and I think cooking is about developing your own taste - how spicy, sweet, salty, you like your food will dictate the finer nuances of your cooking and in turn your own personal style. So recipes are a guide - adjust, adapt at will - do not be strangulated by the straight jacket of prescriptive ingredients but use them as a guide - try the recipe and then try your own thing. This is Franca Colonna Romano's recipe from Sicilia in Bocca, so as regards finding wild mountain fennel - good luck but I have seen wild fennel growing by the roadside in less urban areas - so go forage! It is a famous Palermitan recipe, known throughout Sicily although with some variations. We shall give the original version. The indispensable ingredient for this very tasty dish is wild mountain fennel. It can also be prepared with cultivated fennel, but if we said the result is the same it would be a gross untruth. Ingredients for 6 persons: 600-700 grams maccheroncini, 1 kilo fresh sardines, 1 big onion, 100 grams pine-seeds, 100 grams sultanas, a big bunch of wild fennel, the packet of zaphran [saffron], 1 glass of oil, salt. Boil the wild fennel, strain well but do not throw away the water. 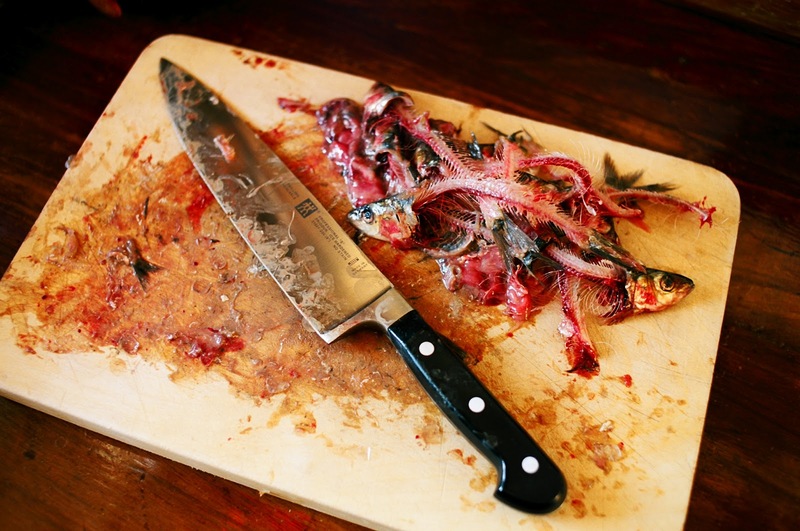 Chop the fennel up on a board with the point of a knife. 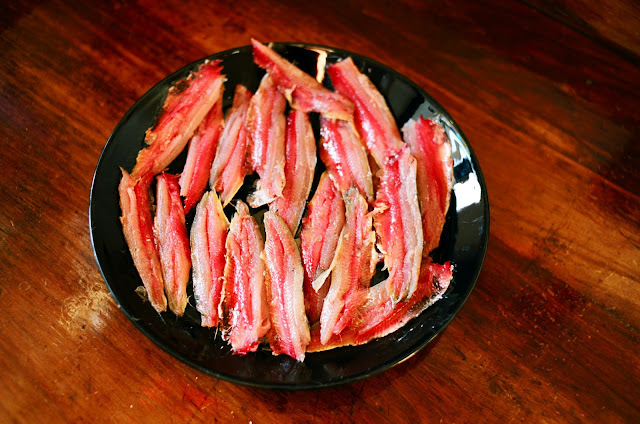 Fry lightly in a frying-pan a well chopped onion, add the sardines, cleaned and boned, and mix until you get a pulp. Add the wild fennel, the packet of zaphran, salt, pepper, the pine-seeds and sultanas and the sauce to acquire flavour. In the meantime you will have cooked the maccheroncini in plenty of water diluted with the water of the fennel, taking care not to let them get too soft. Season the pasta with one part of the sauce. Prepare a large baking-tin, grease with oil and put a layer first of pasta, then sauce, ending with a layer of sauce. Put the tin in the oven on a moderate heat for a few minutes. These maccheroni are delicious both hot and cold.